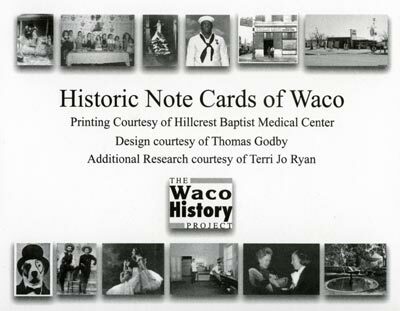 Cards depicting Waco history are on sale at several locations. The stationery is a fund-raising vehicle for the Waco History Project. The effort to compile and design the cards was spearheaded Terry Goodman and underwritten by the Hillcrest Baptist Medical Center. Golden's Book Exchange, Temple Rodef Sholom, City of Waco Visitors Center gift shop, Sironia, First State Bank, Laverty's and the Waco Tribune-Herald. For more information, e-mail Jackie Lott at jlott41@msn.com. The Waco History Project has been awarded $2,010 from the Waco Foundation for its "Stock the Shelves" initiative. The effort is to get Waco history books into area school libraries. "Stock the Shelves" had its first gift earlier this year when a donation from the Lake Brazos Rotary Club made possible the donation of several books to University Middle School. Left to right: Barbara Myers, UMS librarian; Principal Rail Moreno; seventh grader Alejandra Maldonado, eighth-grader Neel Patel; Waco History Project board member David Lintz (Red Men Museum) and Clare Paul, president of the Lake Brazos Rotary Club.